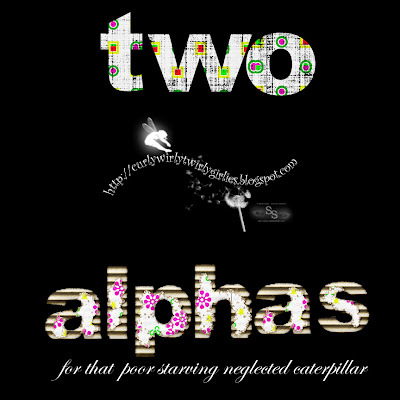 The alphas for the caterpillar are here. A rough / grungy style one, and a prettier (?) torn cardboard one. Both of them are very pretty. Thanks much for sharing. Just popping in to leave you some love! Boy, you have been busy! Great stuff you have here! I see you finally got your actions installed. Isn't it SOOO much easier? What an awesome series you have designed. Thank you for lovingly sharing your wonderful talents.